A steam turbine is a device that extracts thermal energy frae pressurized steam an uses it tae dae mechanical wirk on a rotating output shaft. Its modren manifestation wis invented bi Sir Charles Parsons in 1884. Because the turbine generates rotary motion, it is parteecularly suited tae drivin an electric generator. 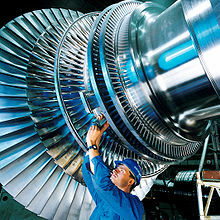 The steam turbine is a form o heat ingine that derives much o its improvement in thermodynamic efficiency frae the uise o multiple stages in the expansion o the steam, which results in a closer approach tae the ideal reversible expansion process. This page wis last eeditit on 20 Apryle 2018, at 06:05.